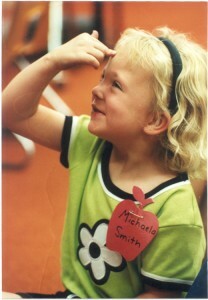 This is our daughter, Michaela, on her first day of Kindergarten in 1996. It’s been a long road of education since then! 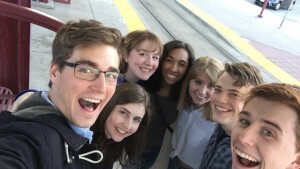 We didn’t know that Michaela would come to be diagnosed with several learning disabilities, or that she would also have multiple broken bones from osteopenia caused by celiac disease, or that all the stomach aches she had for years wasn’t because of anxiety about school, but rather from a mast cell disorder. We were new parents to a second child, Morgan, who on that day was just 7 months old and yet to have his first allergic reaction. My husband and I did and do expect a lot from our two children. We expect them to listen to their bodies and to honor their physical needs – to carry EpiPens and Benadryl always, to eat safe food always, and to take their medication appropriately and consistently. We expect them to listen to their brain and to challenge themselves academically – to try their hardest even if they receive a grade of a “C” or worse, to go to school every day and to try to learn. We expect them to listen to their heart and to follow their passion in life – to be of service and helpful to others and to treat others with respect even if they haven’t received that in return. We encourage them to find a higher power in their life that brings them joy and peace. We encourage them to love and value each other and to spend time together. We empower them to self-advocate for their needs with their friends, family and especially at school. We empower them to question the adults in their life, because sometimes even an adult doesn’t know the safe food to feed them. Mostly, we enjoy them. We enjoy their sense of humor; we enjoy laughing and laughing until we cry; and we enjoy the life that all these challenges of so many diagnoses have provided to our family. All of these things together have made our children who they are. When I heard a psychologist say to me “Don’t expect too much from her” when my daughter, Michaela, was in 3rd grade – I didn’t have the 22+ years of parenting under my belt that I do now! 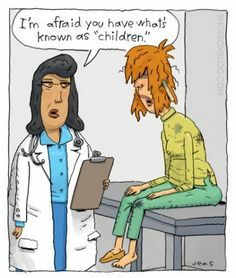 I had just heard a list of diagnoses a page long from the experts in a “child study” the school performed on my daughter. We knew she was having difficulties in school, but even that list of diagnoses the experts provided didn’t include celiac disease or a mast cell disorder which she was diagnosed with later. She struggled for years with dyslexia, for which we got her a reading tutor; ADHD, for which we determined to not medicate her but instead to completely change her diet away from foods with preservatives, colorings, sugar and caffeine; and an auditory processing disorder, for which we obtained a 504 Plan, along with the other two conditions. This combined effort still didn’t create ease and comfort for her to attend school. It took until high school to get the diagnosis of celiac disease. By that time, the enamel on her teeth had worn off, and she had suffered multiple bone breaks in her arms and toes! She was in college before she got the diagnosis of the mast cell disorder. Michaela expected a lot from herself despite everything that she was experiencing. We didn’t focus on what she couldn’t do well. We helped her to focus on everything that she could do – like laugh at herself when she made a mistake, think outside the box on school projects, intuitively know how others were feeling, and encourage her to embrace being different in her thinking processes. I remember when Michaela graduated from high school. We were on our way to the graduation ceremony when she said, “I’m so glad I’m done. The last good year of school was kindergarten!” If that doesn’t make you feel terrible as a mother! Yet, she signed up to go to college at a local community college, and found that the college lifestyle fit her needs much better. She could schedule her classes later in the day, when she was ready to go to school. She could focus on an academic area of her choice – Communications (she was always good at talking, having gotten many infractions for chatting in grade school!) She started to understand that she was good at school when she could ‘do school’ the way it fit her. She transferred to a larger school, the University of Colorado at Colorado Springs (UCCS), for her last two years. She didn’t like this school nearly as much since the classes were larger, and the professors not near as caring. 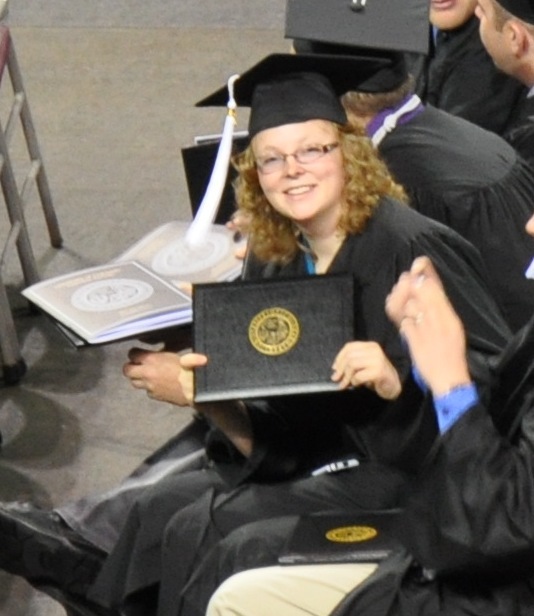 However, she kept going, while working two jobs, and graduated in May with a GPA of 3.3! What a wonderful accomplishment for a child with so many diagnoses! If you’re wondering if your child can do this – I assure you they can! Take it one day at a time, love your kids, be proud of their accomplishments however big or small. Don’t let a few diagnoses alter your hopes or your child’s hopes for the future. Does Your Child With Food Allergies Dislike Being ‘Different’? 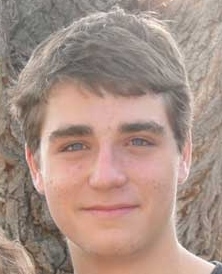 My son, Morgan, is now 17 years old and has a long time to process feeling ‘different’ from his peers. He frequently hears from other children with food allergies who ask him questions like “Do You Get Tired of Being Different?” Morgan got the opportunity to answer this question in an email that he received earlier this week. I so enjoyed his response that I wanted to share it with all of you. I can’t personally say I’ve ever been tired of being different; I actually rejoice in it! It makes me, ME. In the same way, having food allergies to peanuts, eggs, or animals makes you, YOU. I really enjoy being different. Why? Well, I went to a Boy Scout camp when I was younger called Camp Alexander. My mom and I really didn’t feel comfortable having the chef cook my food, so we pre-cooked and brought up all of my food for the week long camp – it was a lot of work, I know! But, it was completely and absolutely worth it. While other Scouts were having bouncy macaroni or dried out cereal, I got to have steaming hot pancakes and sausage that I knew was both tasty and safe! If I wasn’t different, I’d never be able to have that awesome food; instead, I’d be stuck with the regular ol’ cereal. I really don’t like to be stuck with the generic stuff…it’s boring! However, I know there’s a lot more to being different than just tastier camp food. Sometimes in school you may have to eat something different than all the other kids, and it really doesn’t feel good, right? I know the feeling. You just want to be like all the other kids instead of being different, right? Or, as you said, you have to have your mom organize all the food parties to make sure you’re safe. I’m sure you’ve been playfully teased about your food allergies – like kids complain about the fact that you just have to have food allergies. I say move on. Ignore them. I don’t know if you look up to someone or you want to be like someone, maybe a superhero. Iron Man maybe? I’m not sure. But if you do, just know they’re different too. They are someone SO different than everyone else and that is what makes them so special and awesome! I like being the “allergy child” or the “allergy kid.” It tells me they’re jealous. They don’t get special treatment (like kings. I mean, come on, we’re definitely treated like kings.) from their moms or dads or get special food simply because they’re different. They’re stuck with that plain ol’ bland cereal instead of awesome food that you like! I really do think they’re jealous. So, you know what I do? I have a lot of fun with my awesome food and ignore them. It makes me a proud Mom to read my son’s response and to know that he means every word of it. I’m too am glad my son is different. We Moms didn’t ask to be on this path of advocating for our children with food allergies, but I for one am glad that I’m on this path with many other fabulous, intelligent Mothers who just want their children to be safe and happy! 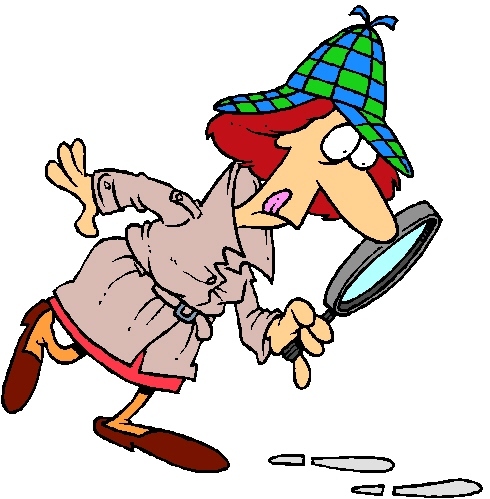 Have You Become a Food Allergy Detective? Truly, it was frightening to not know why he was reacting when we went to the library, for example. We’d bring home several books. I’d look over at Morgan and he would be a mucousy mess. We never quite figured out that reaction for sure. It was probably a combination of the fact that the library had a “Paws to Read” program where they brought a dog into the library on a weekly basis to listen as kids read. Morgan had bad dog allergies, but at the time I didn’t understand that the dog hairs left behind could be enough to cause a reaction for him. It could have been the various pollens, dust, smoke, peanut dust and dander on the books themselves. Or it could have been something that we never thought about. All one summer, Morgan had horrific eczema. We thought it must have been the sunscreen we were using. I continued to purchase new and different products in an attempt to find the mysterious cause. It took years to figure out that it was the ‘kid foods’ at the pool where we frequented. Kid foods have lots of food dyes in them. Turns out that Morgan got eczema from all food dyes. We found this out when we eliminated food dyes from his diet, at the suggestion of our allergist. So the Popsicles he was eating daily at the pool helped to exacerbate his eczema. What a relief it was to come to that realization! After Morgan had an anaphylactic episode to fish on a camping trip, we thought we could still grill fish at home. We’d grill it outside our house on the deck, use a special grilling ‘cage’ for the fish, clean up scrupulously afterward – and all would be fine. This worked for a few months. Then, one morning we weren’t so lucky. We had eaten fish the night before, and Morgan had been fine. But the next morning, his eyes swelled shut and then began bulging. We dosed him with steroid eye drops, Benadryl and raced off to the allergist. Our doctor determined that Morgan had touched the fish that probably wasn’t cleaned entirely off the countertops or some surface inside our house. He had likely then wiped his eyes. That was a frightening experience! We determined then that it’s not worth eating fish even with preparing it outside on the grill. We just aren’t able to be careful enough to ensure his safety. All this detective work has been necessary to try to have some control over Morgan’s environment. Ultimately it’s helped him to gauge whether a situation is safe for him. We talked through many situations with him as he was growing up to determine what might happen based upon past experience. He is one of the most sensitive food allergic children that I know. We learned though how to keep him safe. We’ve found that it’s REALLY necessary to have a safe home. It allows his immune system to be on ‘pause’ while he’s sleeping. As for Mom here – I’m sure the local police force would appreciate my detective abilities. I’ve honed them well through the years! 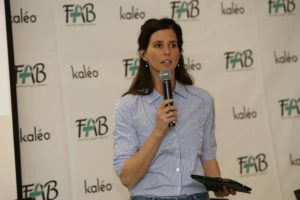 Sloane Miller, food allergy advocate, author and life coach, is founder and President of Allergic Girl Resources, Inc., a consultancy devoted to food allergy awareness. She consults with private clients, the healthcare, food and hospitality industries, government and not-for-profit advocacy organizations. Ms. Miller earned her Master of Social Work at the New York University’s Silver School of Social Work and her Master of Fine Arts in Writing and Literature at Bennington College. 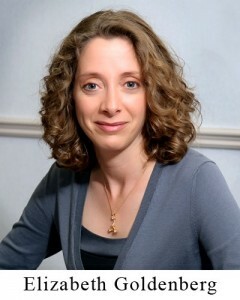 In 2006 she started Please Don’t Pass the Nuts, an award-winning blog for and about people affected by food allergies. In 2011, John Wiley & Sons published Ms. Miller’s first book, Allergic Girl: Adventures in Living Well With Food Allergies, the definitive how-to guide. 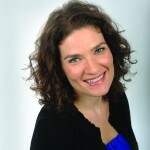 Ms. Miller combines a lifetime of personal experience and passion with professional expertise to connect with people about how to live safely, effectively, and joyously with food allergies. You can find her at www.allergicgirl.com. Sloane, can you please tell us what food allergies you manage and when you were diagnosed? I have always been an allergic girl. I have had food allergies since birth and I developed environmental allergies, eczema and asthma in early childhood. I am also a social worker and writer. In 2006, I became “Allergic Girl” and started the award-winning blog, Please Don’t Pass the Nuts, as a way to talk about food allergies. I wanted to share my experience and connect with other people with food allergies; talk about what I was going through dining out, traveling, dating and working and the things I learned. My work as a food allergy advocate—“Allergic Girl”—combines my commitment to helping people with my personal experience as someone with food allergies and my professional expertise as a social worker and writer. What is your most recent experience with food allergen-related anaphylaxis? What were the circumstances and what did you learn from the experience? My most recent anaphylactic experience was in 2009 after kissing a man I had been dating. Earlier that evening, we had gone over my allergens, my anaphylaxis action plan and where I kept my emergency medications. This was prescient. Later that evening, while kissing, I broke out in intense hives and started wheezing. He had eaten cashews earlier that day and, even though he had no proteins in his saliva, he had cashew nut dust in his beard. My reaction to that nut dust was swift and severe, but because we had discussed what we needed to do in an emergency, I were able to take care of the symptoms with his support and without further escalation. The experience underscored that how vital is it to have and to know your anaphylaxis action plan, to have your emergency medications on hand in all circumstances and to communicate your needs clearly and concisely to others around you so they can support you. 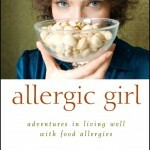 I love your book, “Allergic Girl: Adventures in Living Well with Food Allergies” especially the chapters about dating. What can you suggest to teenage girls and boys about how do you say “No” at that age to a good night kiss from a date who ate your allergen?! Thank you! No one ever talks about food allergies and dating so I devoted a whole chapter just on that topic. Truly, the best defense, as they say, is a good offense. Don’t wait and watch while someone you want to kiss eats your allergen then goes in for a big smooch! As difficult as it may be, speak up about what your needs are in a clear and factual way to your potential kissing partner. The last thing they’d want to do is hurt you! Extra credit homework: It really helps to practice having this conversation. So, enlist a safe friend or parent to practice how to talk to your date about food allergies, your anaphylaxis plan, where your medications are and what you need to smooch safely. As kids grow, they become involved with activities where the parents are no longer involved. How can parents prepare their teens and preteens for handling food allergies while away from home? Are there some ‘absolutes’ in terms of “You Must Do This…”? Teaching a child learn self-advocacy skills can never start too early; alternatively it’s also never too late! Ideally, once your child has been diagnosed with food allergies, engage them with age-appropriate advocacy skill sets. For example, n=knowing exactly what their allergens are, how to speak up about their food allergy needs to an appropriate adult, identifying allergens, how to read labels and that you have to do it every time and most essential: knowing their personal anaphylaxis action plan and having access to emergency medications at all times. As every child is different, go where your child is; for example, a shy child will advocate differently than a bold one. How can parents prepare a child with food allergies with the steps to take in an ‘emergency’? Once your child has been diagnosed with food allergies and you receive an anaphylaxis action plan from your board certified allergist, think of it as the beginning of an ongoing process and conversation. Like a fire drill, run through the steps of that anaphylaxis action plan and equally important, engage your child about what an “emergency” means. Explore with your child the possible scenarios, solutions and outcomes as well as their feelings, fears and concerns. With younger children, this conversation can happen with play or through art; with middle school and high school children let them lead you to the emotional place they need to go. And keep practicing. At different life stages, fears, concerns, worries as well as strengths and accomplishments change. Remember, an anaphylaxis action plan is a live document and what constitutes an emergency is living conversation. What are the key tools/rules you use to keep yourself safe? I find for myself, my readers and my coaching clients that the best tool to create a safe environment where ever you are is to take your food allergies seriously and manage risk. What does this mean? See a board-certified allergist. Ask a lot of questions of your allergist so you will fully understand your diagnosis. Fill your prescriptions and always carry them with you; also know your anaphylaxis action plan. Communicate your food allergy needs to those a round you so they can help and support you. And, be patient with yourself. There will be mistakes. Being prepared will help. Sloane and Morgan hit it off right away. It takes a food “allergic girl” to really understand a food “allergic boy”! They shared stories about managing food allergies in restaurants and school and more. It’s so wonderful for our kids to have great mentors like Sloane. You’re probably also wondering…just how tall are Morgan and Nicole? Or is Sloane just a tiny little thing?! She is a ball of energy…and a tiny little thing next to the two of us! I have found it really helpful to be part of a local support group of food allergy families. 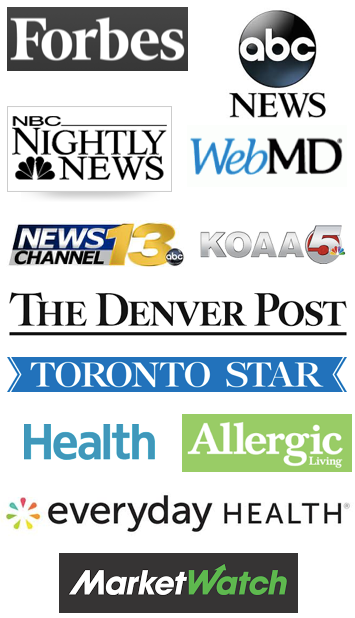 Our local group is called MOSAIC – Mothers of Severely Allergic Infants and Children in Colorado Springs, Colorado. There’s a very active MOSAIC group in Denver, Colorado which has been meeting for several years. Our group in Colorado Springs is newer, but we continue to grow and to have great meetings. It’s great to have other food allergic parents to talk to about schools, local grocery stores and local laws. In fact, our group had a paramedic come to one of our meetings and tell us what would occur should one of our children go into anaphylaxis. A local allergist and I started the MOSAIC group here by contacting as many people as we knew who have food allergies in their family. Then, he continued to give the information to his patients as they were diagnosed. The group has continued to grow from there. Other allergists in town now participate in the group and give out flyers to their patients. We’ve had several discussions about accommodations for food allergies in school. We’ve also discussed Eosinophilic Esophagitis, nutrition for children with food allergies, the emotional aspects of food allergies – the list goes on and on! If you are a member of a support group, please let me know and I’ll send you an AllergicChild brochure for FREE via email to pass out to your members. If there’s no support group in your area, maybe you should start one! Speak with your allergist about other families in your area who have food allergic children, and start from there. Some support groups combine efforts to get legislation passed in their state. 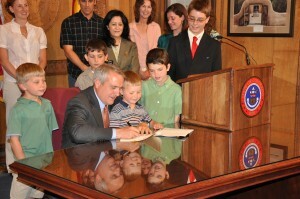 The picture above shows several Colorado support group leaders with their children watching while then Colorado Governor Ritter signs into law the COLORADO SCHOOL CHILDREN’S FOOD ALLERGY AND ANAPHYLAXIS MANAGEMENT ACT. Since meeting through the process of getting this legislation signed, the Colorado support group leaders meet once a year to discuss food allergy issues and initiatives in the state. It’s a great group of advocates, and lifelong friendships have transpired. Our statewide support group leaders also help to run booths at the FAAN (Food Allergy & Anaphylaxis Network) walk. There’s no end to what several concerned parents can do! As a follow up to last month’s article about Managing Food Allergy Bullies I received many requests to write more about our experience with other parents who have bullied me and/or my husband about our son’s food allergies. It isn’t easy to manage the fears that come with sending our children off to school and then to add other parents and their issues really can push us to our limits of civility! It was a very difficult time when our now 16 year old son, Morgan, was in kindergarten and first grade. The elementary school had never had a child with food allergies as severe as Morgan’s. 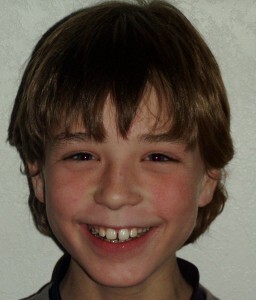 And he was the first student to receive a 504 Plan for his food allergies. I had been friends with a group of three other women prior to Morgan starting elementary school who had heard me talking about Morgan’s food allergies around the neighborhood at birthday parties and soccer practices. Two of these women had children Morgan’s age, and they experienced firsthand the changes in the curriculum that had to occur in kindergarten to keep Morgan safe. And boy did they have an opinion about it! On one occasion, the kindergarten classroom had a ‘restaurant’ for parents to come in during lunch. Peanut butter and jelly sandwiches had always been the menu item. Instead of this item, cheese sandwiches were served. I heard about it from one Mom who told me that pb&j sandwiches sure did taste better! I realized later that I expected my friends to understand my child’s food allergies and to provide support. In the end, that was too high of an expectation. Another Mom told me that she hoped her daughter wouldn’t be in Morgan’s classroom the next year because she was tired of all the changes in regard to food. That really hurt my feelings. Sadly, things only got worse with these parents; however the school principal and teachers were very supportive and followed Morgan’s 504 Plan which required an allergen free classroom. The school staff was responsible to keep Morgan safe and that’s what was most important to me. My friendship with these Moms deteriorated. I couldn’t seem to find the right words to express my upset with them, and therefore stayed silent and distant. The school continued to follow Morgan’s 504 Plan and kept him safe in his allergen free zones in the classrooms and lunchroom. They also made sure Morgan was emotionally supported as well. A few years later, the top blew off the situation. One Mom announced at a PTO meeting that she was done following “all the no peanuts rules” and was bringing peanut butter cookies to Field Day for all the students. However a parent whose son was in our Cub Scout Den spoke up that she wasn’t willing to support that and children with peanut allergies deserve to be safe. I was so proud of this Mom! And it felt so good for someone to stand up for Morgan and for ALL the kids with peanut allergies especially when her children didn’t have any. For some reason, my former friends thought that my son was the only one with food allergies. I always got the sense that they thought we had manufactured his allergies for him to get more attention. I spoke to the principal of the school after that PTO fiasco and learned that she had been dealing with this Mom for years with multiple issues around food. There had been demands that her son needed protein in the form of a Snickers bar in the classroom for a snack. Thankfully, the principal had stated that a different form of protein would be necessary. There had been threats by the Mom to bring in peanut butter cookies to a party because that’s what she wanted to bring. The principal told me that she said, “then the cookies will be immediately removed from the classroom and sent home.” I am so grateful that the principal had such a backbone, and that she stood up for Morgan’s safety. My husband, Bob, got to experience an upsetting situation after we received a phone call from the principal one day when Morgan was in 5th grade. We learned that another Cub Scout from our Den decided to sit in the peanut-free zone at school eating a Butterfinger bar. When Morgan couldn’t get the child to move, he went to the principal to help him. The boy was promptly removed from the table and his father was called. The principal also called us immediately to let us know what transpired at school and that the boy had been suspended from school for a day. Since my husband knew this father very well through Cub Scouts, he called him to discuss the situation. The father was irate that Bob would call, and then this Dad decided to come over to our house to yell some more and state that his son would never do what he was accused of. Thankfully, Bob is a patient man and just let this Dad vent before saying that he didn’t appreciate what his son had done and Bob realized this Dad was in complete denial that his son had done anything wrong! Thankfully this never occurred again. During all these issues, I continued to work with my school and school district to further education and awareness of food allergies. Once Morgan was in 4th grade, the school district added food allergy awareness training to its accreditation model; in 5th grade, Colorado passed a law allowing him to self-carry his EpiPen and the school district started a Food Allergy Task Force to create guidelines to keep children with severe food allergies safe in school. I focused all of my energies on these activities, and kept the school staff focused on my son’s safety. These parents got to throw tantrums and nasty words around, but fewer and fewer people listened to them. Their bark (and their bite!) didn’t arouse any sympathy as more and more children with food allergies came into classrooms. This month’s main article will touch many hearts. Dee Benson, mom to Laura, lost her beautiful 18 year old daughter to peanut-induced anaphylaxis in 2004. 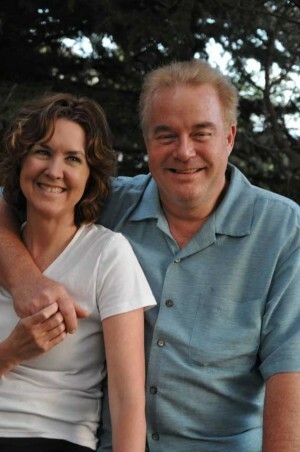 She’s never told Laura’s story and wanted to tell all of you about her. It’s heart-wrenching to realize that we really do deal with life and death when managing food allergies. Dee, tell us about your daughter Laura. What did she like? What were her dreams for the future? Thanks Nicole for the opportunity to tell Laura’s story. Laura, like most teenagers, loved being with her friends. She loved God and was on the worship team at her church. She had a passion for performing and took every opportunity to sing and dance on stage. Laura never shied from the spotlight and didn’t mind standing out from the crowd. Most of her wardrobe consisted of neon colors and clothing she had “improved” with scissors and puffy paint. But above all, Laura cared deeply for people and really invested herself in them. Whether it was staying up all night to make presents for her friends just to show she cared or donating her hair to Locks of Love or pouring her energy into promoting school music programs, she tried to make her little corner of the world a kinder and more beautiful place. What was your daughter Laura allergic to? How old was she when you found out about her allergies? Laura had many allergies. She was allergic to trees and grasses, dogs, cats, dust, and peanuts. Her peanut allergy was by far the most severe. When Laura began eating solid foods, my mother gave her part of a peanut butter and honey sandwich, and within minutes her face was hugely swollen. Later, before Laura turned 2, she had to be rushed to the hospital because she had trouble breathing. It was at this time that she was also diagnosed with Asthma. Had she ever eaten peanuts before? Did she experience an allergic reaction then? Laura had infrequently come into contact with a few peanut products (candy, with peanuts or peanut butter) over the years. Generally, she would spit them out because she was aware of her allergy and also because she just didn’t like the taste of peanuts. On those occasions, she would take her inhaler and call me. I would bring her Benadryl and in a while she would be better. Did Laura understand about her peanut allergies? Did she carry an EpiPen? She understood that she had a severe allergy to peanuts, and she took it very seriously. I did leave an EpiPen with her middle school office, which was never used, but Laura didn’t normally carry an EpiPen. Tell us about the camp that Laura attended. Had she been there before? The high school group at her church did a Spring Break service project every year. They went to a camp in Northern California to prepare the camp for summer. They painted and cleaned and had a great time. Laura had been at this particular camp before and was looking forward to it. What happened on the day Laura died? At lunch, one of the camp staff had prepared rice krispie treats with peanut butter, but nobody labeled the snack or informed the kids of the ingredients. Laura loved rice krispie treats, and it never occurred to her that anyone would make them with peanut butter. After she ate it, she went to one of her counselors and told him that she believed there were peanuts in the snack and that she was having an allergic reaction. The counselor told her to go back to her room and lay down for a while. When she got worse, she went to her counselors again, and that’s when they realized that she needed medical attention. They called the ambulance, which was several miles away. Laura died on the way to the hospital. Aside from not letting her go at all, I would have required a nurse and EpiPens be available on site. Laura had filled out her own application for the camp, which stated that she had a peanut allergy (as well as other allergies) and asthma, so the church and the camp were given information on Laura’s condition. Has the camp done anything differently since Laura’s death in 2004? I haven’t contacted the camp, but I hope that they would now review all allergies listed on campers’ application forms. What advice can you offer to other parents of children with food allergies? Be prepared for emergencies, and enjoy every minute you have with your children. Food allergies comprise much more than just a physical component. The emotional aspects of food allergies continue to rear up with each stage of development in a child’s life. Dealing with extended family members who may not “get it” can create strained relationships. With those family members who do understand, it’s so wonderful to have another advocate on your side! This month, my friend, Jenny Kales, of The Nut-Free Mom Blog and I are discussing our experience with our extended family and food allergies. Nicole: When my son, Morgan, was diagnosed with food allergies at 18 months old (after having two severe reactions – one to touching peanuts, and one to his MMR shot) I was convinced that no one but me could take care of him! Yet, I quickly learned that my husband needed all the information about Morgan’s food allergies and how to operate the EpiPen. I also learned that our extended families needed to understand the change in food habits that would be required for Morgan to be able to attend family gatherings. My father immediately said that I was overdramatizing my son’s allergies and that I’d make him into an anxiety-ridden child! He began sending me research reports about how it would be good for Morgan to be around cats and dogs (two more of his severe allergens). My father had suffered from asthma as a child, and his own mother had babied him into his adult years. I began to understand where his comments were sourced, yet I didn’t give up on the need for my son to NOT ever be around his food allergens or pets. I continued to try to educate my father about food allergies and what would be necessary for him to do to be around Morgan. Jenny: One thing I’ve found, both in my own experience, and from the experiences that people share with me, is that some extended family members have the philosophy that kids can somehow “tough out” a food allergy or that a small amount of a food allergen helps cure the allergy. You are going to find all sorts of opinions that conflict with what you need to keep your child protected. I remember one Thanksgiving (at my in-laws) where one of the kids at the table wouldn’t eat the dinner, but wanted a peanut butter granola bar instead. Everyone asked me if that was “OK.” The child in question was sitting right next to my daughter and while I don’t believe that every food allergy risk can be eradicated in life, I believed that my daughter had a right to a comfortable Thanksgiving meal and I said “no, that’s not a good idea.” That was just one incident where I was on the spot and felt that others were humoring me; they didn’t really believe that food can be a threat to a child. Over the years, much of this has improved but I still feel that I’m being humored at times, especially when it comes to restaurants or when I don’t allow my daughter to eat baked goods from a bakery. There will always be family members who think you’re limiting your kids unnecessarily. I’d love it if my daughter could have the freedom to eat whatever she wants but the reality is that she can’t or her health is at risk. You need to develop a thick skin and also a sense of what your bottom line is, i.e. making good choices for your child’s health. Nicole: Oh those holiday meals! I can remember one Christmas when Morgan was not yet 5 years old and my husband’s entire family had a get together. It was three families, plus my mother-in-law, which totaled 6 kids and 7 adults. I had asked family members to please not bring any of his food allergens to the Christmas Eve dinner, (which at the time were peanuts, tree nuts and shellfish.) The dinner was not at our house. My mother-in-law just couldn’t live without her crab puffs on Christmas Eve, so she said she made them with artificial crab meat! I was very hurt, and couldn’t understand why she wasn’t able to forego her crab puffs just that year. I was still concerned about cross contamination in the manufacturing process, even if it was artificial crab meat! Then a neighbor showed up with nut covered brownies for everyone to share, and while I requested for my husband to deal with this, they still got eaten in our presence. We had prepared Morgan’s food separately, yet we still worried about all the food allergens in the house, and I didn’t feel comfortable causing a scene, packing up and leaving for home. It wasn’t a pleasant Christmas Eve experience for me. From that year on we have always had Christmas dinner at our house where we can monitor and prepare all the foods. It’s a small price to pay for peace of mind. The good news is that now, some 10+ years later, my in-laws are very concerned about food allergies and Morgan’s safety. 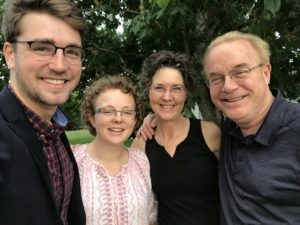 At my nephew’s high school graduation party last May, I received a phone call from my brother-in-law ensuring that what he was preparing was not going to cause any issues. He knew that Morgan would be bringing his own food, but he wanted to ensure Morgan’s safety to the utmost! Nothing like education and awareness…and patience on our part!! How do you deal with the preparation of holiday meals? What about location of the festivities? Jenny: I like to be able to cook for the holiday meals as much as possible and by now, everyone understands this and welcomes it because fortunately, they like my cooking! J When we do eat at someone else’s home, I have a hand in the ingredients and cooking as well. I always bring dessert, too. I have to say I have a very short list of people that I think truly understand how to cook for my daughter. As the years have progressed, I do think that people in my family have gotten used to dealing with food allergies at holiday meals. However, since we are so careful and we have not had a lot of repeat reactions in recent years, sometimes others might think that the risk is somehow lower. They don’t realize how much effort goes into preventing a reaction. When it comes to holiday parties that are not hosted by close family members, all bets are off. We usually just bring something to the party that we know my daughter can eat and sometimes she might eat before or after. It’s really important to keep reiterating to extended family members (or friends) that we don’t think you have an “unclean” kitchen or are deliberately trying to harm anyone. It’s truly difficult to explain cross contact to people. Another thing is that food is extremely tied to emotion and tradition, and this especially true at the holidays. So I try to understand that not everyone will want to or be able to provide a complete menu that is OK for my daughter’s allergies. We will work around it as best we can because we also try to emphasize that family traditions are not only about food, but about spending time together and other non-food activities. However, if we’re not sure about a food, my daughter doesn’t eat it. That rule stays firm wherever we go. Nicole: It sounds like you have more comfort with others cooking for your daughter than we have for others to prepare foods for our son. I’m not saying that’s a bad thing at all! I think that’s probably a learned thing for your daughter. Morgan is really uncomfortable with anyone cooking for him in our extended family – and I know he learned that from my husband and me. He’s especially concerned with any foods that he might be allergic to being served because of the chance of a spoon or spatula being used in one of his safe foods. He’s grown accustomed to showing up places with a cooler full of safe foods for himself. There’s several different ways to deal with a child’s food allergies in family gatherings. The best way is what brings safety and security for your child! Jenny: I am actually really cautious about letting others cook for my daughter and I certainly want everyone reading this to be cautious as well. It’s so important. Let me clarify—when I say a short list of people who we trust, I mean maybe two people. And even for those people, we go over all the steps, cleaning, cross-contact, etc. Usually I’ve got a hand in at least some of the cooking, so I see what’s going on in the kitchen. These “trusted” people are also not likely to have the allergens in their homes in the first place. For example, my sister (my daughter’s aunt) never buys peanut butter any more. When I say that we work around it, I mean that we will just bring our child her own meal if there is any risk involved in eating the food. Usually people are very accommodating to us, but ethnic traditions play a role. For instance, one side of my husband’s family is Greek. Nearly every Greek cookie or cake either contains tree nuts or came into contact with tree nuts; baklava is one example. It’s nearly impossible to eliminate these desserts off of a celebration or holiday menu, because of the strong cultural ties. Sometimes we might go to an event but bring Alex a separate meal or side dishes, etc. You can’t be shy about refusing potentially unsafe foods since avoidance is our best weapon against reactions. We’ve probably offended some good cooks along the way without meaning to. Certain cultures equate food with love and that is especially true for Mediterranean cultures! 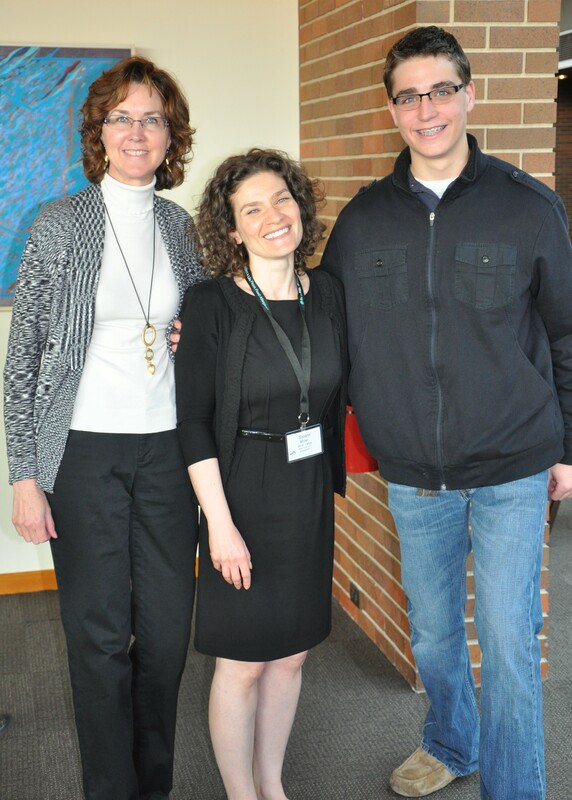 Nicole: Thanks Jenny for sharing your experience with extended families and food allergies. There’s many ways to enjoy the holidays – and enjoyment is the key! In the recent CNN article, Food allergies make kids a target of bullies, statistics were given that about 35% of children over the age of 5 with food allergies have been bullied, teased or harassed. There has been a lot of press on bullying recently, and this particular research published in the Annals of Allergy, Asthma and Immunology brought it closer to home for us. Our school district defines Bullying in their Policy as follows: Bullying is defined as any written or verbal expression, physical act or gesture, or a pattern thereof, that is intended to cause distress upon one or more persons in the school environment. 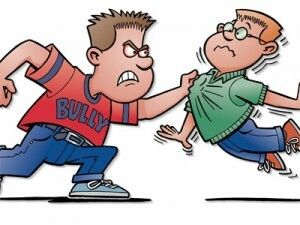 Direct bullying can be physical in nature, such as hitting, kicking, pushing, or choking. Or, it can be verbal, such as name-calling, threatening, teasing, etc. 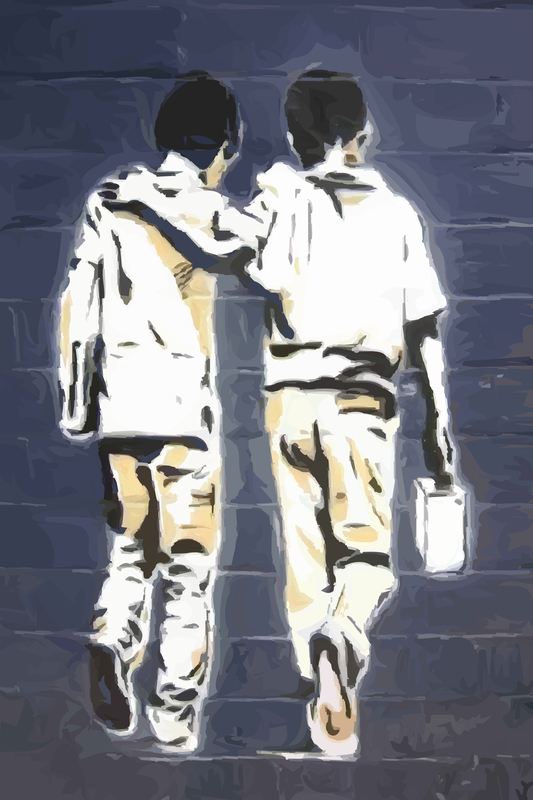 Indirect bullying is subtle and may be difficult to detect, such as social isolation, intentional exclusion, making faces, staring, obscene gestures, manipulating friendships, etc. 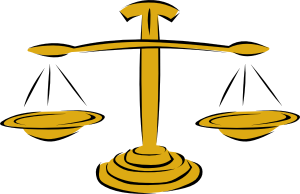 Bullying may include an imbalance of power between the bully and the victim. Our son was thankfully bullied only a few times in elementary school, and not at all in middle school or high school. I’m sure it has helped that we’ve lived in the same community for 17 years, so Morgan has gone to school with the same children since kindergarten. These kids have been aware of his food allergies for years, and most have been very caring and compassionate about bringing in safe foods. I feel it’s important to share the specifics of the bullying instances to help other parents be aware what our school district felt was inappropriate behavior that needed to be immediately stopped. The first instance occurred in 1st grade when a little boy chased Morgan around the playground after lunch saying he had a peanut butter cracker and “I’m going to kill you.” Morgan didn’t even take the child seriously because he knew the boy was emotionally immature, and he wasn’t sure the boy even had any food in his hand. A friend took Morgan to the playground monitor to report the other child’s behavior! The playground monitor immediately sent the bullying boy to the office whereupon the Principal called the parents and the child was suspended for the rest of the school day. This impressed upon everyone the seriousness of food allergies and that food should never be used as a weapon. Since Morgan was the first child in the school to have such severe and multiple food allergies, this set the tone for the rest of the families. 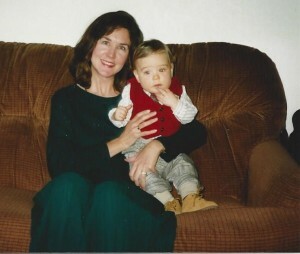 The good news is that this little boy (who’s now a big boy!) is now very good friends with Morgan. They put this issue aside, and our families have moved on to become good friends too. They are now some of the biggest advocates for keeping Morgan safe in their home! The second instance of bullying occurred when a child tried the same behavior on the playground, however because of a language barrier his parents didn’t understand the implications. He wasn’t suspended as far as I know. He too had some emotional issues. Later in the school year, his parents brought in sesame snacks to celebrate the Chinese New Year and had to once again be reminded that this was a severe allergy of Morgan’s and the snacks had to be sent home. This boy ended up in my husband’s Cub Scout Den, so the family got a close up lesson about food allergies. We all ended up being friends in the end! The last instance occurred in 4th grade when a boy sat at the Peanut-Free lunch table at school with a Butterfinger candy bar and wouldn’t move. Morgan tried to get the boy to move to no avail. He then enlisted the Principal to assist him, because she happened to be in the cafeteria at the time. The Principal took the boy to the office and contacted his father. Morgan came home to tell my husband and me about the story, and my husband called the boy’s father to discuss it since the child was in his Cub Scout Den also! The father was furious that his child was being singled out for this behavior and thought that nothing inappropriate had been done! Thankfully, the school had already warned the child that sitting at the Peanut-Free Zone table with non-safe foods wouldn’t be tolerated in the future and it never occurred again. Since these instances, Morgan has never been bullied again. Morgan is forthright about his allergies when the information would be helpful for others to know. It helps too that he’s very tall and towers over most of his classmates and older students! Regardless, the Principal in each of the situations acted swiftly and decisively which set the tone that bullying behavior with food would never be tolerated. I believe that most school districts have a bullying policy in place. Read through your school district’s policy! It helps to see what they determine to be inappropriate behavior. If inappropriate teasing, harassment or bullying does occur, encourage your child to talk with an adult immediately. We’ve continued to have conversations with Morgan about the potential for nasty comments from his classmates, just to keep us in the loop about any issues. He’s been very willing to share with others about his food allergies – not to be called ‘Allergy Boy’ but rather to be a self-advocate to ensure his safety. There’s a fine line between sharing the appropriate information and setting oneself up for teasing. A good school policy helps to support this balance.